Recently we talked about the Toshiba TG01 touchscreen mobile which seems to be a strong competitor to iPhone, now details about a new LG Arena KM900 multimedia smartphone have leaked on the Internet. It’s a touchscreen phone and it looks very much similar to Samsung Omnia. It has a high quality touch display with a new 3D user interface which is called the ‘S Class’. It has a metallic design and is a lot more compact than Omnia. The user interface looks a bit like the iPhone one. Apart from that, it has a 5MP camera having DVD quality video recording capability and it also supports Divx video playback. Connectivity options include Bluetooth, GPS, WiFi and EDGE/GPRS. More details about the phone will emerge when it will be showcased probably at the MWC 2009. 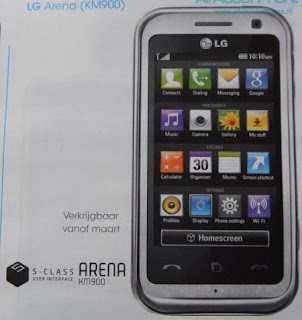 The LG KM900 does look good and it is expected to be launched by March 2009.